← Pope Thanks CIA Panetta Sure to be Indicted for Crimes Against Humanity? 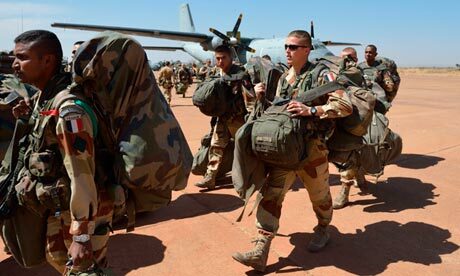 French troops invade Mali to steal natural resources. When the mainstream media reported that French troops were involved in military conflict in Mali to support Malian government soldiers who are reported to be in a battle with Islamist rebels, kept out of the news was the real reason for the French and now British and American involvement in Mali, namely, the huge deposits of gold, uranium, diamonds, precious stones, copper and much more. According to the mainstream media the French government sent 2,500 troops in support of Malian government soldiers who are reported to be in a battle with Islamist rebels, the British and American governments followed shortly. While the mainstream corporate-controlled media have taken the line that this move is to tackle Islamist rebels, the truth is far more straightforward. According to R Teichman, in his article, The War on Mali. What you Should Know: An Eldorado of Uranium, Gold, Petroleum, Strategic Minerals … (Global Research: January 15, 2013), Mali is Africa’s third largest gold producer. Over 5200 tonnes of uranium is said to be located in regions within Mali. Diamonds and precious stones have been found to be in abundance within Mali. 1.2 million tonnes of bauxite, which is an essential mineral in the production of aluminum metal is located in Mali. “In the past French governments have been happy to prop up dictators across the region, like Félix Houphouët-Boigny in the Ivory Coast. It carried out a brutal colonial war to stop Algeria getting independence. The war for Africa’s resources did not end with European empire building, nor will it end any time soon as corporate giants set their sights on securing vital resources in another scramble for Africa. What is even more shameful and treacherous is the involvement of African troops in support of French, British and American terrorism. These puppets do not serve African people nor do they have the interests of their country at heart. This entry was posted in International News and tagged French troops nvolved in military conflict in Mali, The war for Africa's resources, scramble for Africa. Bookmark the permalink.